One of HotWhopper's visitors, Greig, referred us to an article written back in 1995. The article was written by someone called Thomas Gale Moore, who was at the time writing as Senior Fellow, Hoover Institution. I googled Thomas Gale Moore and found that he was also associated with the pro-tobacco lobby. It seems he has a history of disinformation. Greig was citing the article to support his claim that "there is plenty of scientific and practical reason to question the pessimism" (around global warming). So I thought it might be worth checking to see how Greig's chosen article fares nineteen years later. One thing Thomas Gale Moore writes is that "Should the world warm -- and there is little evidence or theory to support such a prognostication ..."
In 1995 the global surface temperature was 0.33 above the 1951-1980 mean. Since then it's gone up around the same again - rising to 0.67 above the mean in 2010 and 2013 was 0.61C above the 1951-1980 mean. One "prediction" down. What else did Thomas get wrong? He mentioned food prices and cited a study by Kane et al (1991) (which I couldn't trace), which he said indicated "...a decline in commodity prices under moderate climate change conditions". Let's see what has happened to food prices with the climate change over the past nineteen years. Here is a chart of the Food Index from the FAO (click to enlarge). Well, the food index in real terms is 50% higher than it was in 1995. Two "predictions" down. 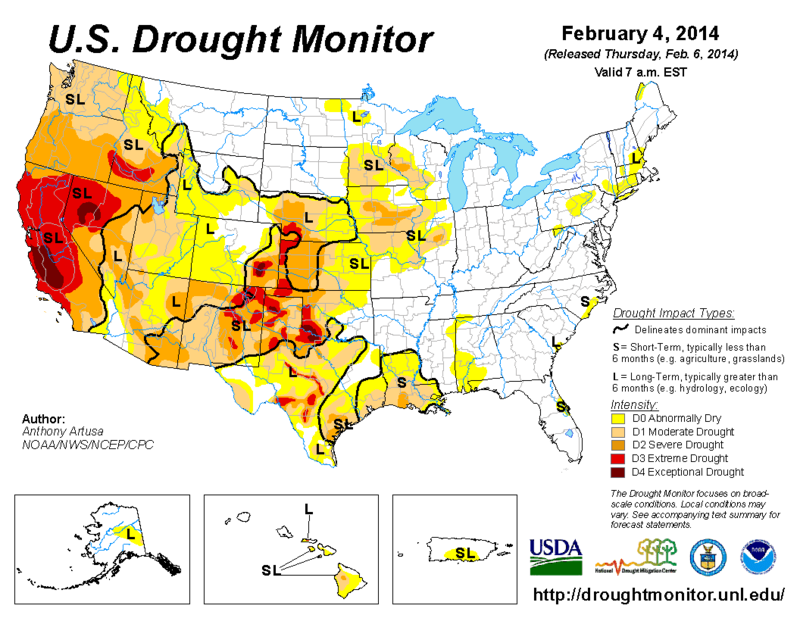 The southwestern USA is experiencing what could be the worst drought in 500 years. And the prognosis isn't crash hot, either. That should be sufficient to demonstrate that Thomas Gale Moore, while he may be good at some things, has not got any skill in climate predictions. Most of the rest of his article is yearning for the "good old days" when dinosaurs roamed the earth and other nostalgia in a similar vein. I can understand why Thomas feels comfortable with dinosaurs and other old fossils. From what I've read, I think the current expectation is that the north east USA generally will get wetter and the further south-west you go it's generally expected to get drier as global warming kicks in. Of course, the SouthWest has varied definitions although AZ and NM are always included. Of course, climate could care less about state boundaries, so regardless of the label, the models expect Southern California to get drier, with Northern California unclear, and Pacific NorthWest getting wetter. AS a whole, CA might actually get the same water, despite the current drought, but the real water issue is that 50% of the reservoir capacity is Sierra snowpack, and that is a problem no matter what. CA grows half the fruit and veggies for the US. So, Dude, that would of course explain why there's no snow on the Sierra. It's because they're protecting a minnow. Dude - you're a bit mixed up. The State and Federal water projects deliver river water not reservoir water. The reservoirs collect snowmelt and runoff from the mountains and are not related. And it's a smelt not a minnow. The Feds and the State control how much water is pumped up from the a Delta inflows to the canals which deliver water to the ag interests in the Central Valley. They don't control reservoir collections much further upstream by the the water districts. It's the pumping stations which had to cut back their deliveries because of the endangered smelt. The reservoirs are low because of lack of snowmelt, because of the drought. Food prices seem to correlate well with oil prices, and that would make sense when you consider the amount of diesel consumed in agriculture. Notice the spike in 1973. Increased corn prices were most definitely an issue linked to higher demand arising from biofuel production, and this may have contributed to higher food prices in recent times. Ignore the obvious oil price volatility and skewed demand, and the graph suggests a slight downward trend in real prices. However to be fair I doubt this is due to warming temperatures as Moore suggests, more likely due to advancing technology, increased efficiency, in agricultural practices. "Increased corn prices were most definitely an issue linked to higher demand arising from biofuel production, ... "
So the biofuel demand has fallen suddenly in the year 2013? In reality corn prices exploded because of a succession of devastating summers in Russia/Ukriania 2010 and in the Corn Belt 2011 and there again in 2012 plus Russia again. So by the end of 2012 the world corn (and some other e.g. grain) reserves were at a historic low. The Arab Spring, the Syrian war have everything to do with this. Climate revisionism walks over hecatombs by now. I recommend everyone take the time to follow Sou's link to page 213 in Chapter 7 of the IPCC First Assessment Report. There is no clear indication of warming in that graph that correlates to GHGs, so considering the time Moore was writing, his comments on the availability of temperature data was limited and allowed for some conjecture. On food prices, I suggest looking very carefully at the graph to identify the real vs nominal price . As mentioned elsewhere, the correlation appears to be with diesel prices, as evidenced by the spike around the 1973 oil crisis. If there is any possible link between lowering food price and AGW, it cannot be discerned from such a graph, either way. There has been much said about droughts in Australia and links to climate change, which has in recent times become subdued by the very obvious correlation with ENSO (read climate variability) So any suggestion that the drought in southern California might be related to AGW is silly. If anyone wishes to argue, suggest you refer to the science as reported in IPCC AR5 and SREX, referring specifically to a correlation (or lack of) between observed climate change and droughts. Of course, it was also wrong for Moore to suggest there being a link between warming and more rain in the US southwest. It may seem logical to think warming might cause more rain (how often do you hear such claims linked to catastrophic flooding), but climate change is more complex than that. That was the point I was making when I referenced Moore - for all the pessimistic claims about extreme weather, droughts, floods etc. you get from climate alarmists, the same apparently rational predictions can be made by the climate optimists. And scientific analysis can and does often make a mockery of both. I think Greig is trying to argue that it is perfectly reasonable for an economist to ignore or contradict climate science or only select the bits he likes, because that way he can claim that dinosaurs liked it hot and plants like CO2 therefore global warming (which he says isn't happening) will be good for the world today. I think Greig is trying to argue that it is perfectly reasonable for an economist to ignore or contradict climate science. My analysis shows pretty clearly that your criticism of Moore is wrong, he does not "ignore or contradict climate science ". Your comment about dinosaurs shows you are confused. And CO2 encourages plant growth (plants like it), regardless of warming. Your inability to accept that warming has some benefits impacts on your credibility in this debate. It shows you are biased, or too lazy to argue your case that the downsides of warming outweigh the benefits. You are arguing that my criticism of Thomas writing: "Should the world warm -- and there is little evidence or theory to support such a prognostication ..." is misplaced. And that the "CO2 is plant food" argument is not one of the dumbest fallback positions when compared with all the problems that warming brings. Honestly, Greig. If you want to deny science, can't you come up with something better that a 19 year old article by a tobacco-defending dinosaur economist? Give it a rest or go read some science. There are plenty of HW readers who will explain to you the bits you don't understand. Of course that pre-supposes you would like to understand climate science - of that you've shown no inclination. You're too busy trying to defend the indefensible. I find it odd that you call me "lazy". Do you really think that's the case? Do other readers agree that I'm lazy? HW averages more than one blog article a day poking fun at denialists and pointing out how wrong they are. It's not the purpose of this blog to repeat every bit of the science. Scientists themselves do that. I point readers to the latest IPCC report, which describes climate science very well. The upcoming IPCC reports will describe the impacts and vulnerabilities of society to climate change. No. This is a patently dishonest counterfactual claim. Your output on this blog *alone* demonstrates that. the "CO2 is plant food" argument is [not] one of the dumbest fallback positions when compared with all the problems that warming brings. It isn’t a “fallback position”, it is one of the benefits of AGW that must be weighed against “the problems”. That’s the whole point of economic analysis. You haven’t defended your criticism of Moore above, simply engaged in name-calling, demanded that I do my own research, and finally pointed at the latest IPCC report as if it supports your criticism of Moore’s economic analysis (which you should know is disingenuous). You also asked a question of your community, you got an answer which you didn’t like, so you deleted it. It is your right, but it’s still bad form. Greig, the very fact that I have allowed so many of your comments should have told you that I don't delete comments simply because I don't like them. HotWhopper has arguably the most lenient comment policy of climate science blogs and anti-science blogs alike - maybe with the exception of Tim Lambert's site currently (but not in the past). It is way more lenient than, say, WUWT as you well know. The comment policy is very clear about what gets deleted vs what gets moved to the HotWhoppery vs what gets removed permanently with no explanation and no trace. The deleted comments fell into the last category. Any half decent person would have been utterly disgusted by the comments that caused me to ban that particular person and I think/hope you'd have done the same. As for telling me what to write and what not to write, I say to you "go jump". I've written plenty over the past 12 months rebutting the sort of nonsense that your mate Moore peddles. I'm not about to be dictated to by dumb deniers or spend all my time pandering to your whims. (Anyone with half a brain can see the deep flaws in Moore's gish gallop). 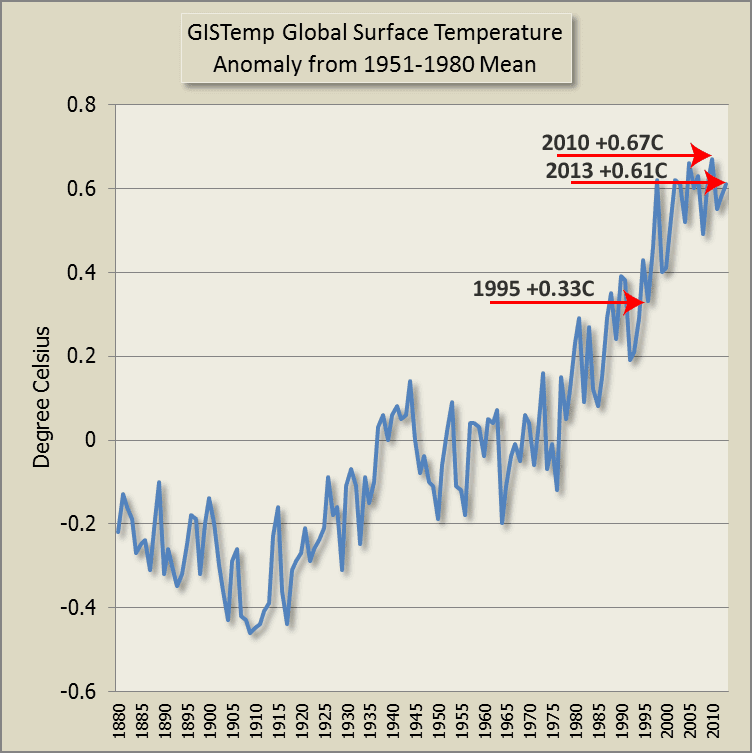 "It isn’t a “fallback position”, it is one of the benefits of AGW that must be weighed against “the problems”." Grieg, the benefits have been weighed, and the growth enhancement of some plant taxa does not outweigh the overwhelmingly many negative consequences of warming the planet more than about 2 degrees Celsius. Even a 1.5 or a 1 degree warming would be difficult to justify, so sensitive are the many ecosystems to the changes such warming brings. Don't believe me though - check the literature. Go forth and do some proper learning. Some comments have been deleted because they were from a person who was banned some time ago for multiple infringements of the comment policy - namely extremely ugly racist and sexist remarks. He has used various identities - Peter, Paul, Duke, duke, db, dbs among others. I don't normally explain deletions - the comment policy says it all. However I missed his earlier comments and only caught up with them today, so this is to explain the disjointed discussion. dbs of wuwt perhaps? If so, I'm less than surprised to see him foaming at the mouth elsewhere. Steve, I think I got that wrong, it was "dp" IIRC and dps or something like it. There is a dp who comments at WUWT. I don't know if it's the same person. He'd be banned from WUWT too, probably, if he made the sort of comments he did here.